Super fast rack mount 4 slot USB‑C disk dock lets you edit directly from your media disks! Blackmagic MultiDock 10G is an advanced SSD dock that lets you access 4 separate SSDs via a single high speed 10 Gb/s USB‑C connection. Unlike cheap consumer adapters, Blackmagic MultiDock 10G has been specifically designed for the film and television industry and features a rack mount design with an independent SATA driver chip on each disk, ensuring much faster data transfer speeds. That's perfect for editors, colorists and media management on set! It can even be used for SSD compatibility on HyperDeck Extreme! 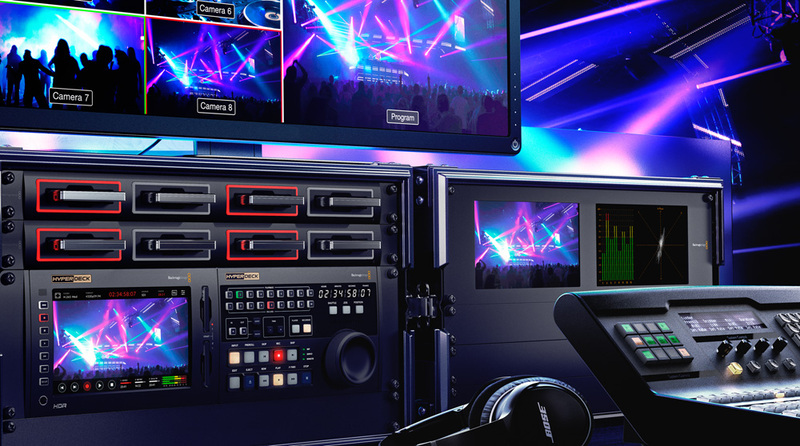 Only Blackmagic MultiDock 10G gives you the industrial strength design you need for professional work. Unlike cheap SSD docking cables, the Blackmagic MultiDock 10G is a compact 1 RU all metal design you can mount in any professional rack. Each disk slot features an illuminated disk indicator so you can see when disks are being accessed. The design is also repairable so you can replace the socket connector in each slot. Simply plug into any USB‑C Mac or Windows computer and there is no software to install. The rear panel features 2 USB‑C connections and a slide switch to allow selecting between using 4 disk slots on a single USB‑C connection, or 2 slots on each USB‑C connection for shared use. Plus the built in AC power supply provides lots of power to run 4 SSDs or hard disks at the same time. Blackmagic MultiDock supports up to 4 independent 2.5 inch SSDs so it’s possible to edit directly from the disks you recorded onto. Simply plug in your SSDs and they will mount on your Mac OS X and Windows computers like regular hard disks! Because Blackmagic MultiDock features 4 independent disk slots, you can mount all your media from a shoot all at the same time! Blackmagic MultiDock 10G is perfect for accessing media recorded with the URSA Mini Pro SSD Recorder. It's also the perfect solution to add SSD compatibility to HyperDeck Extreme 8K as it will let you interchange disks between HyperDeck Studio models. You can even stripe multiple disks together for a super fast RAID array! Solid state disks are the perfect storage solution for television because they are very fast and extremely large in size. Even a single solid state disk is much faster than a disk array because the memory based storage is accessed instantly without the mechanical lag, allowing a single SSD to record an entire event or film shoot. This means you get reliable, fast recording with the speed for the largest video files. With Blackmagic MultiDock 10G, it’s possible to plug in any brand of 2.5 inch solid state disk or if you need high capacity backup at low cost, a regular 2.5 inch laptop hard disk can be used. Best of all the driver is built into the operating system so no extra software is needed. Blackmagic MultiDock uses advanced USB‑C technology so you get blazingly fast transfer speeds to your computer at up to 10 Gb/s with a single cable connection! That’s more than enough bandwidth to handle the highest resolution video formats including 8K in H.265 from HyperDeck Extreme 8K! MultiDock features a completely independent disk interface chip per disk slot so you never get slowdowns because of SATA bandwidth issues. Even though you get all 4 disks connected to a single USB‑C connection, you can also split Blackmagic MultiDock 10G and get 2 disks on one USB‑C connection and 2 disks on the second USB-C connection. That's perfect for dual computer use or increased speed. Unlike consumer disk arrays, Blackmagic MultiDock is a compact and robust 1 rack unit all metal design that can be quickly installed into equipment racks. The built in power supply ensures no power is used from laptop batteries and it has enough power to run 4 high performance disks all at the same time for use in RAID configurations. Blackmagic MultiDock 10G even supports the RAID software built in to most operating systems, so you can customize your disk array for your needs. Each disk slot also features an attractive illuminated disk access indicator so you can see when your disks are being accessed. SSDs are so incredibly fast it's no longer necessary to use RAID arrays to get enough speed for editing. That means you can add up to 4 media disks to editing software such as DaVinci Resolve, Final Cut Pro X, Premiere Pro CC, Avid Media Composer, Autodesk Smoke and more. Blackmagic MultiDock 10G is also fantastic for backup as you can insert mechanical hard disks into the slots and backup direct to the disks. Mechanical hard disks are used on laptop computers and are extremely large and very low cost. If you're working with HyperDeck Extreme, you can also use Blackmagic MultiDock 10G to get compatibility with SSDs for interchange between HyperDeck models. The secret to using Blackmagic MultiDock 10G with HyperDeck Extreme is the high speed USB‑C port on the rear panel called External Disk. When you plug MultiDock into the HyperDeck External Disk port, it can see the SSDs and use them for recording. When using 2 HyperDeck Extreme units mounted side by side it’s possible to switch to 2 channel mode and use 2 disks with each HyperDeck. This also means it's possible to use 2 computers with a single MultiDock, one using each channel, or multiple rack mount servers can access the same MultiDock. When an SSD is inserted in MultiDock, it can be seen on the HyperDeck Extreme on screen menus and you can select it for record and playback. 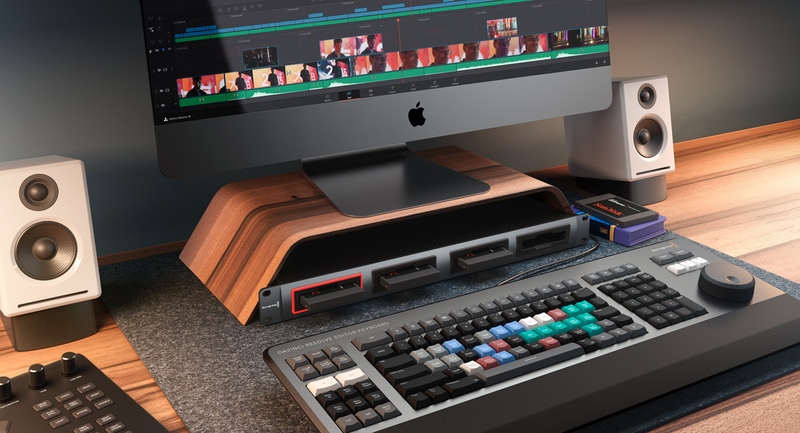 If you're working in large facilities, then Blackmagic MultiDock allows media disks to be relocated simply by unplugging the disks and walking to a new location. That eliminates slow file copying and there is no need for complex network storage. This means you get the flexibility to change and move workflow as your client demands. You can even take your job from an editing room into a dedicated DaVinci Resolve color correction room and then move to a larger theater style room when your client arrives to review your job. With instant unplugging of media you eliminate clunky devices hanging off cables plus you can always access the disks right from the front of the rack equipment. Super fast, rack mount 4 slot USB-C solid state disk dock that lets you edit directly from your media disks!